Working as Cabin Crew is very rewarding! You get to travel and experience many different cities and cultures, meet a lot of interesting people together with colleagues that soon will become your second family. 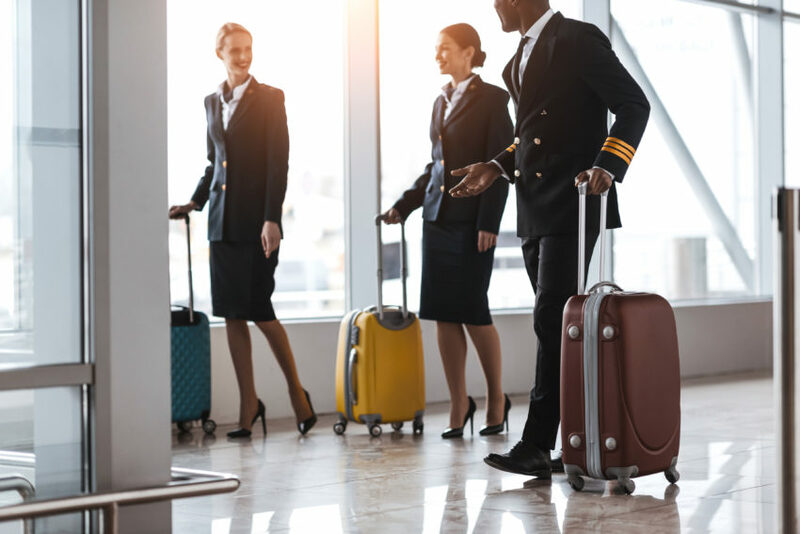 Now that you know that you want to become Cabin Crew you can start the 'Cabin Crew Recruitment Journey'! The Cabin Crew Recruitment Journey is divided into three steps: the Application, the Online Tests and the Assessment Day. Here you can read more about what it takes to pass all the needed steps in order to get one step closer to your dream career! The very first thing you do when applying for a position with us is to write your application. Remember, we receive thousands of applications every year, make sure that YOUR application stands out. Also make sure to read all the minimum qualifications carefully before sending in your application. First of all are we interested in getting to know you. Who are you and what have you done before applying for this position, and why you are applying for the position. Make sure to emphasize the experience you have that are relevant for the position you are applying for. A neat and nice application creates a good first impression and makes the experience of reading your application enjoyable for us. Once finished with your application and updating your CV in the profile you may be asked to answer some mandatory questions. After these steps you will receive an email with a confirmation that we have recveiced your application, if you don’t receive any remember to check your junk-mail folder. If you are successful in the first step you may be invited to complete an online assessment. Not all airlines operates with online tests, so you might not always complete this step, but if you are you will be asked to complete these assessments as a fair and consistent means of finding out more about you. Note that if you have applied and completed these tests in the past 12 months you will not have to re-complete them, however, you will need to submit your assessment scores for your new profile. You can do this by clicking the link in the email invitation, accessing your profile, review your new test invitations, then select a language for the test, click ‘next’ – the results will then transfer to your new application. Most assessments are tablet enabled, but you may need to use a laptop or PC with Flash Player enabled to launch some of the assessments. We will ask that you complete the assessment(s) as soon as possible by logging into your profile. Some assessment(s) are timed ability assessments, whilst others may be untimed behavioral questionnaire(s). You do not have to complete all assessment(s) in the one sitting, but we encourage you to complete them as early as possible. Once you launch an assessment there will be instructions and practice questions available for you. Here you will be able to familiarize yourself with the section and proceed to the real assessment once you are comfortable to do so. We are always looking for good candidates, and are working through a high volume of applications and test results, but we always aim to come back to candidates as soon as we can. We will always give you feedback on the position you applied for. However, depending on the position and time of year the time taken to give feedback may vary. If you are unsuccessful you will receive an e-mail from us, and you are welcome to apply again on a later occasion, but we do ask you to wait 12 months. If you have been successful, you will receive an invitation for the next step. You have passed the screening and online assessment and we like you on paper, now is your time to show us that you are as great as we think you are. You will receive an email with the invitation for an upcoming assessment day, where we will ask you to register your attendance. If you for some reason are not able to attend any of the dates set up – make sure to register as “not able to attend”. This will show us that you are still interested in coming for an interview on a later occasion. You will receive a final confirmation email for the date once all assessment days have been fully allocated. We will be in contact with you again if your preferred date is unavailable, as all allocations are made on a first in, first served basis. It is important that you arrive on time, and the first thing you will do is register yourself upon arrival. When everyone is registered, the day begins. We will first do a presentation of our company, and the airline you will be flying for. In the OSM presentation we will explain to you who are we and what our role is. You will later be divided into groups of 3 – 10 candidates. Each group will participate in a group assessment and work as a team to solve a task. Following the group assessment, you will attend an individual interview. We have now seen you in a team setting and would like to get to know YOU even more. We will ask you some questions related to your previous work, also called a “behavioural interview”. We may for instance ask you how you would handle different situations. To make it easier for yourself try to think of different work related situations you have coped with and how you faced the different situations.Most of all we want to get to know you, and our professional recruitment team will do their best to give you a good experience, it is not only about us getting to know you but also for you to get to know us. The day is over and the next step is on us, we will go through all the candidates and come back to each and every one of you as soon as we have made a final decision. If you are unsuccessful you will receive an e-mail and are welcome to apply for a position with us again after 12 months., and if you are successful the HR team will contact you either by mail or by phone to arrange the course start date. >> Want to read more about the Cabin Crew Training?